For all the hummus lovers out there! Homemade hummus is so cheap and easy to make and with this Roasted Butternut Squash Hummus, you are getting a hidden vegetable portion too. 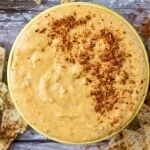 The baked pita chips are the perfect thing to dip in it too. 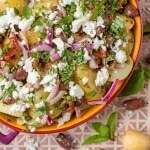 This Mediterranean potato salad has it all – put a twist on a classic and give it a try. All of the best flavours of the Mediterranean mixed up into a delicious bowl of potato salad – packed with olives, sundried tomatoes, lemon juice, feta and a ton of herbs. 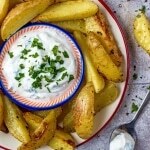 Potatoes are a cheap and easy side dish, and these Garlic Potato Wedges are the best way to eat them. Chunky and crispy, and a real burst of garlic flavour. These wedges will keep the whole family happy and they go with almost everything! 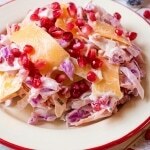 All of your favourite Mexican flavours mixed in to a healthier and lighter coleslaw. Add it to tacos, burgers, salads and sandwiches. 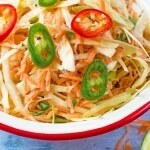 This Mexican Coleslaw a side dish you need to try. Coleslaw is a must on every Christmas buffet table, so why not do something a little different and make this Butternut Squash Coleslaw. The butternut squash added means it’s an easy way to get some extra vegetables in to your diet and it adds some extra crunch too. 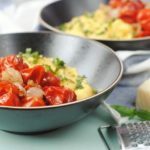 If you are looking for a simple and comforting way to use up a bumper harvest of tomatoes, then try roasting them and serving them with this creamy polenta. Simple comfort food at its best. 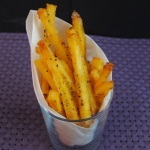 If you are looking for a side dish that takes minimal effort, then baked garlic polenta fries are for you. You just put them in the oven and wait for them to get all crispy, golden brown and delicious.